One very excited girl ………. This morning my daughter excitedly rushed to the computer to check the results of the Craft section at the Royal Melbourne Show which starts today. She had entered 2 photo’s in the Year 7 – 9 category. All of a sudden there was screaming coming from the front half of the house ( Mum, Mum, I, I, I, just got 2nd prize!!!!!!). She was so excited ……. to say the least, and I am very proud of her efforts. I guess I won’t be able to keep a camera out of her hands from now on. 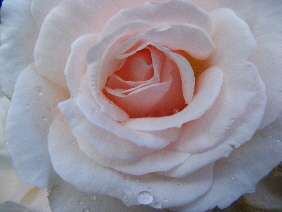 She loves taking photo’s of flowers & nature. Hope you all have a pleasant weekend, I’m off into the garden………..
Well, Spring has certainly sprung in this neck of the woods and I have been bitten by the gardening bug. Totally distracted from my sewing, pottering around the garden. I have discovered Pinterest, which is also a major distraction – but oh so inspiring!!!!! 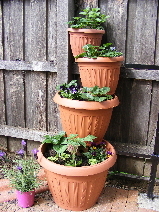 This picture is my attempt at stacking some pots with herbs, flowers & veggies. I have planted mint, basil, strawberries, tomato, pansies & violas (Johnny Jump Ups). 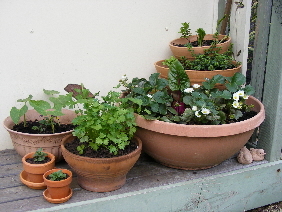 My other attempt was just at grouping some pots with strawberries, peppermint, thyme, beans, violas, silverbeet, parsley and a couple of geranium cuttings to fill a gap. My only problems is when I let “the girls” (bantam chooks) out to free-range so have to cover them up with bird netting to keep them out. 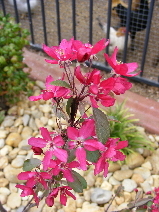 My new crab apple (Tom Matthews) has also just started flowering, such a lovely shade of pinkish red. You can see “the girls” in the background of the photo. More planting & organising this weekend planned as we are trying to finish off the garden (mind you it has taken nearly 2 years to get this far) and we only have a very small garden, but haven’t had the time or funds to get very far. Still a way to go but so much closer than a few weeks ago – having lovely weather is also a great help. Hope you get a chance to catch some rays this weekend.